Blackberries are fairly easy to grow and make a tasty addition to your Texas garden. They grow well in USDA plant hardiness zones 7 through 9. The best Texas blackberry harvests occur when the plants are three to eight years old, though with proper care they can continue producing for up to 15 years. 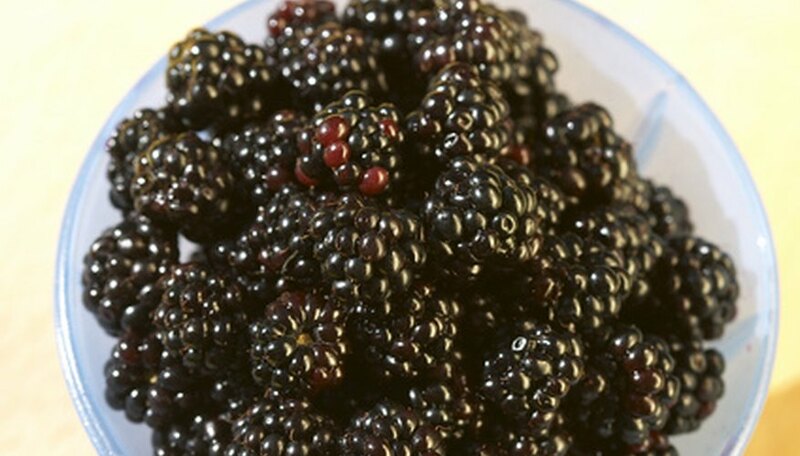 Tasty right out of the garden or added to pies, blackberries are a great choice to add flavor to your garden. Choose a location with sandy or well-drained soil to plant your blackberries. Build a raised bed for your blackberry patch if your soil has poor drainage. Test the soil's pH; blackberries thrive in Texas soils with a pH between 4.5 and 7.5. If your soil's pH is below 4.5, raise the pH by adding lime. If the pH is above 7.5, add sulfur to make it more acidic and bring it within the correct range. Plant root cuttings during the winter dormant season. Lay the root cuttings in a horizontal position two to four inches deep, two to three feet apart within the row, with rows eight to 12 feet apart. Blackberries planted from root cuttings will start producing in their second year. Plant blackberries purchased in nursery containers in early spring for best results. Give your blackberries a good watering when you're finished planting. Start watering established blackberry plants in March or April when the growing season begins, and stick to a regular schedule. During dry periods you may need to water at least once a week. Start reducing the water you give your blackberries by September to slow their growth and to let the canes harden before winter. Cut back the prima canes (non-fruiting canes produced in the first year) when they get 36 to 48 inches high to encourage them to form branches. Cut them back to a point just above where you see a bud for a new shoot forming. Cut the floricanes (fruiting canes produced in the second year and every year after) to the ground after the plants have finished producing for the season and the canes die. Mow your blackberry plants to ground level every three years. This removes any diseased wood that may be present. Remove all dead, cut or mowed plant debris and destroy it to prevent spreading diseases. Monitor your blackberries regularly for signs of diseases or pests and treat as needed with fungicides or insecticides. Blackberry varieties that grow well in Texas include Brazos, which is good for cooking; Arapaho, a thornless, disease-resistant variety; Brison, which does well in south-central Texas or in clay soils; and Rosborough, a cultivar with a sweeter berry that does well in the eastern and south central portions of the state. Your blackberries will grow well in zones seven through nine; the extreme southeast portion of Texas and extreme northern tip of the panhandle are outside these zones. If you live in either of these areas your local conditions may prove unsuitable for blackberry planting. Always read and follow label directions for fungicides and insecticides, for your safety and to prevent damage to the plants. Angie Mansfield is a freelance writer living and working in Minnesota. She began freelancing in 2008. Mansfield's work has appeared in online sites and publications such as theWAHMmagazine, for parents who work at home, and eHow. She is an active member of Absolute Write and Writer's Village University.